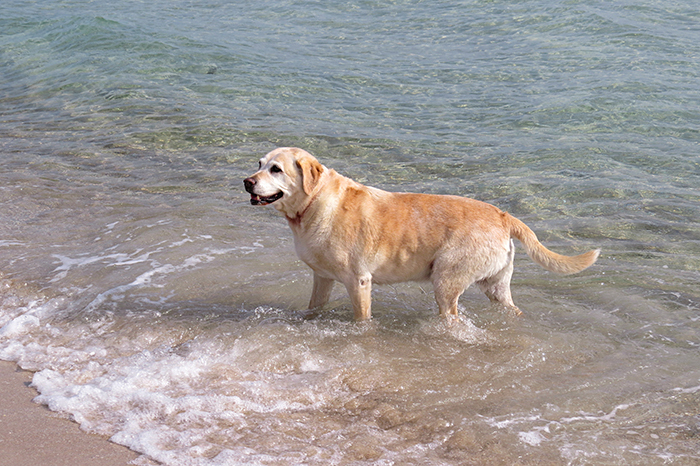 The cruciate ligament is a major part of the canine knee. Cruciate injury is one of the most common orthopedic complications seen in dogs. Sometimes called ACL or CCL tear, a ruptured cruciate is often a painful and immobilising injury. While not a life-threatening injury, it is still one that must be addressed for the sake of the dog. The knee is a complex joint comprised of the patella (kneecap), cartilage called the menisci, and a series of ligaments connecting the femur (thigh bone) to the tibia (shin bone). Together, these components enable the joint to function properly. The knee has two essential stabilising ligaments that cross over one another inside the knee joint. They are called the cranial (or anterior) cruciate and the caudal (or posterior) cruciate. Malfunction of even one part of the knee can cause a great degree of discomfort and lameness. Of the many knee injuries that can occur, cruciate injury is the most common. A cruciate ligament injury can occur in dogs for several reasons. In some cases, it is simply the result of an athletic injury in a healthy dog – landing awkwardly when running or jumping. Overweight dogs are definitely more prone to this type of injury, as they carry more weight and can have weakened joints. Additionally, some dog breeds are predisposed to cruciate ligament injuries. While cruciate rupture cannot always be prevented, keeping your dog at a healthy weight and providing plenty of exercise can minimise the risk. A cruciate ligament injury is the result of a partial or complete rupture (tear). The cranial (anterior) cruciate ligament is the one more commonly affected, though the caudal (posterior) can rupture as well. When the cruciate ligament tears, the tibia moves freely from under the femur, resulting in pain and abnormal gait. Sudden lameness in a rear leg is often the first sign of injury. If the injury remains unaddressed, arthritic changes can begin quite quickly, causing long-term lameness and discomfort. If your dog shows signs of pain or lameness, it is best to have your vet do an exam within a couple of days. Your vet will perform an orthopedic examination, trying to isolate the pain to a specific area and ruling out injury to the foot, hock or hip. If a knee injury is suspected, your vet will check for a cranial drawer sign – this involves manipulating the femur and tibia to feel for instability. A positive drawer sign occurs when the tibia can be moved forward independent of the femur, mimicking the motion of opening a drawer. X-rays may also be performed to check for arthritis or fractures. In a few cases, a referral for more advanced diagnostics may be recommended, such as arthroscopy or MRI. While most dogs with cruciate injuries require surgery, a small number will improve with conservative therapy. This mostly involves several weeks of cage rest. Some vets will place knee braces or prescribe anti-inflammatory medication, but these methods are most often ineffective. A small percentage of dogs will eventually recover with cage rest, but typically these are small dogs, and even the dogs that do recover can re-injure the knee in the future. The preferred method of cruciate ligament repair is surgical. In general, prognosis is good. However, there are different surgical approaches, each with its pros and cons. The traditional surgical procedure is often called the “extracapsular repair.” In this method, the damaged ligament is removed and a very strong suture essentially replaces the function of the cruciate ligament. The tissue of the knee heals over several months and the suture eventually breaks, leaving the healed tissue to stabilize the knee. This is a relatively quick and uncomplicated procedure that can be successful in many dogs, especially medium and small dogs. It is less expensive than other methods, but long-term success is not excellent. An increasingly popular surgical option is called the tibial plateau levelling osteotomy (TPLO). This is a more complex procedure than the traditional extracapsular method. The TPLO alters the mechanism of the knee joint, allowing it to function properly without a cruciate ligament. A cut is made into the top of the tibia (tibial plateau). Then, the tibial plateau is rotated to change the angle and a metal plate is affixed to keep the bone in place. Over several months, the bone heals into its new position. Partial improvement can be seen within days. However, full recovery will take several months, so cage rest is essential. Generally, long term prognosis is very good, and re-injury is uncommon. A third and newer surgical method is called the tibial tuberosity advancement (TTA). Like the TPLO, the TTA allows the knee to function without a cruciate ligament. The details of this method are slightly different, but the TTA still involves cutting of the tibia and placement of hardware. Some surgeons believe the TTA as a less invasive procedure than the TPLO – and with a faster recovery. Regardless of the surgery type, a post operative resting period of eight weeks or more is crucial to the healing process. In addition, physical therapy is often recommended and can be extremely successful for long term recovery.